The chances of me getting more than a couple of minutes at a time to sit down and write a final post for the recent South American adventures is pretty low, so I'll drip feed it here to the blog as and when I have a moment. I'm currently spending my days in the library in Santiago working on a couple of different calculations which never made it quite from mind to hand to paper on the trip and finally it's time to sit down and get them rather more organised. 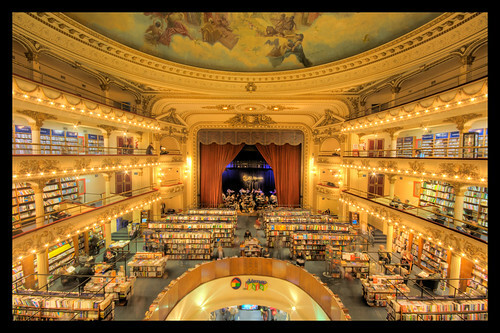 Anyway, I was lucky enough, after the conference in Buenos Aires, to have a weekend to explore the city and so I headed for the famous Ateneo bookshop, renowned as one of the most beautiful in the world. It is indeed stunning, set in an old theatre, but I have to admit that had it been a second hand bookshop it would have been infinitely more pleasant with the combined aroma of old books and the exuberant architecture. As it was, the old surroundings rather clashed for me with the bright lights and buzz of the commercial enterprise. Still, I browsed for a while before sitting down with some Marquez and a coffee. I rather wish I'd gone for Borges now as I still struggle quite a bit with Marquez's Colombian Spanish and complex phraseology. Anyway, worth checking out if you're in the area though I discovered some rather less commercial bookshops with very nice cafes in the Palermo area of the city which I think are even nicer places to spend an afternoon.